His Holiness Baselios Marthoma Paulose II, eighth Catholicose of the East in Malankara. He had his secondary education at Govt. H. S, Pazhanji, Paulmoved to the city of Trissur for his pre-university and undergraduate studies at St. Thomas college, Trissur from where Paul passed in flying colours. He had his postgraduate studies in sociology at CMS College, Kottayam. 1983 at Parumala Seminary. On 15th May 1985 H H Moran Mar Baselius Marthoma Mathews I consecrated Paul ramban as Episcopa with the name Paulose Mar Milithios. His Holiness Baselios Marthoma Didymos I, seventh Catholicose of the East in Malankara. His Holiness was consecrated as Bishop on August 24, 1966 and has been serving as Metropolitan of the Malabar Diocese of the church. He is the seventh Catholicos since the Catholicate of the East was relocated to India and 90th in the lineage of Catholicoi of the East in the Apostolic throne of St. Thomas. He is also the 19th Malankara Metropolitan of the Church. Youth Movement. 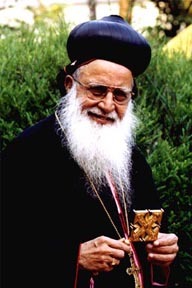 On 16 May 1965 His Holiness Baselios Oughen made him Ramban. The Malankara Syrian Christian Association, which met on 28 December 1965 at M.D Seminary, Kottayam, elected him to the high offer of Metropolitan. On 24 August 1966 at Kolencherry His Holiness Baselios Oughen Bava consecrated him as Metropolitan Thomas Mar Timotheos..
Mount Tabor Dayara and Convent in Pathanapuram. On 10 September 1992, the Malankara Association, which met at Parumala, elected him as successor- designate to the Malankara Metropolitan and Catholicos of the East. 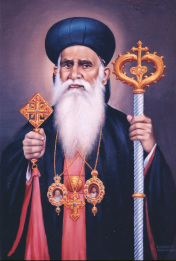 On Monday 31 October 2005 Church H. B. Thomas Mar Thimothios was ordained as the Catholicos of the East and Malankara Metropolitan at the Parumala Seminary. For the first time in the history of the Church, the newly ordained Catholicos was privileged with the physical presence of his predecessor during the installation ceremony. up his body through hard work and his mind through intense discipline and his spirit through spiritual exercise. This writer believes Mor Baselios Didimos I is an exemplification of eastern monastic life. Our tradition of selecting bishops from the monastic ranks has a long history. Unfortunately due to discontinued monastic communities, we could not always select our bishops from thorough-bred ascetics period. Mor Didimos is an exemption to our recently fabricated monasticism as a preparation to receive the episcopate. He has been deeply rooted in his monastic practices and exercises long before he became a priest and a bishop. He has witnessed many late nights during which our new Shepherd kept vigil in the chapel of Mount Tabor Monastery. Yes, indeed the church of Malankara is blessed to be shepherded by a monk of prayer. Mar Didimos is not just a monk, who is enamored of some primitive practices of monasticism. He is endowed with erudition which he derived from his long career as a student of theology, mathematics and English literature. Prior to his consecration to the episcopate he had been a professional educator holding various positions in the academia. He was a mathematics instructor for many years, and was a high school headmaster for more than a decade. After receiving his post graduate degree in English literature he held his lectureship in English literature when St. Stephen's college of Pathanapuram came into existence. His Holiness is also rightly credited with his musical skills; his divine liturgies are musically mellifluous to the ears of the participants. His Holiness Baselios Marthoma Mathews II, sixth Catholicos of the East in Malankara. to everyone who came in contact with him. He was known as "Father Angel" at that time. orator, an eminent scholar, a renowned theologian, an able administrator and a man of the Word of God, he has all the qualities needed for a spiritual leader and a good shepherd. With his intelligence, wisdom, love and vision and with his vast experience in various fields he has proved himself successful as a skillful ecclesiastical head of an ancient Church. With his devotion and dedication in life and sincerity of purpose, no doubt the community at large is benefited by his true Christian life as a servant of God in the service of mankind. into eternal rest on 26 Jan 2006 and laid to rest in Mar Elia Chapel Shastamcotta. His Holiness Baselios Marthoma Mathews I, fifth Catholicos of the East in Malankara. His Holiness was born on 27th, March 1907 as the youngest son of Vattakunnel Kurien Kathanar and Olesha Pulickaparampil Mariamma in Kottayam. He took his B.A andÂ B.D. degrees. Even as a layman he had achieved the unique distinction in studies and also in the Canonical Laws; he was selected as a member of the Managing committee in 1944. He received the order of "Musmrono" on 18 August 1945 at the Old Seminary and on 19 August at Mar Elia Chapel he became a full deacon. 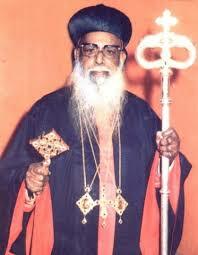 On 27 October 1946 he was ordained as priest by His Holiness Baselios Geevarghese II, Catholicos of the East. 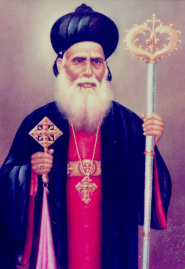 Later, on 21 September 1951, he was elevated to the rank of Ramban (Monk).Â His Holiness Baselios Geevarghese II consecrated him as Episcopa under the name Mahews Mar Athanasios. He was further elevated to the office of Metropolitan on 12 July 1959.
which met on 31 December 1970 at M.D.Seminary, Kottayam. On 24 September 1975, he became Malankara Metropolitan. Malankara Orthodox Church and its right to have its own sovereign Head. He was able to project the name and fame of the church on an international level. On 27 April 1991, due to failing health he relinquished his office. On 8 November 1996 he passed away, and was laid to rest in Devalokam Aramana. His Holiness was born on 26 June 1884 at Perumbavoor , Vengola, to Abraham Kathanar of Chettakulathukara family. He was ordained as deacon by Kadavil Paulose Mar Athanasios and in 1908 at Jerusalem he was elevated to the monastic order of Ramban. He was consecrated as Metropolitan Oughen Mar Timotheos on 15 May 1927 at Jerusalem. He was appointed as the fourth Metropolitan of Kandanad. He has left his imprint in several offices that he held during his life. He was principal of the Orthodox Theological Seminary, and the Metropolitan of Kandanad and Thumpamon dioseses. On 17 May 1962, when the Malankara Association met at Niranam, he was chosen as the Catholicate of the East. It was on 22 May 1964 at M.D. Seminary, Kottayam that he was installed formally as the fourth Catholicos. His Holiness Baselios Geevarghese II, third Catholicos of the East in Malankara. His Holiness was born to Ulahanan and Naithi of Kallaserri family in Kurichi, Kottayam on 16 June 1874. On 24 April 1892, Kadavil Paulose Mar Athanasios ordained him as deacon and on 24 November 1898 he was ordained as priest and Ramban (Monk) respectively by St.Gregorios. As per the order of St. Gregorios, he resided in Kadambanad church and took charge of the southern dioceses. He also served as Manager and Malpan of Old Seminary. He published books like "Sahodaran-marude Charithram", "Rehasya Prardhanakal".,"Parudaisa" and "Mar Yuhanon Mamdana". On 8 September 1912, His Holiness Patriarch Abdhedh Meshiah consecrated him as Metropolitan Geevarghese Mar Gregorios at Parumala Seminary. He was appointed as the Metropolitan of Thumpamon, Kollam and Niranam dioceses. was chosen as Malankara Metropolitan. It was a period when issues became very complex. Through prayer and fasting he received strength from God to lead his people for long years, courageously, inspiring his people to work for their church and for the glory of God. Following the peace pact of 1958, he had the good fortune to guide the destiny of the unified Malankara Church. Apart from consecrating twelve Meropolitans, and ordaining more than thousand priests and deacons, he founded and consecrated many churches. On 22 April 1932 and on 20 April 1951 he conducted the 'Mooron Koodasha' (Chrism Consecration) at the Old Seminary. 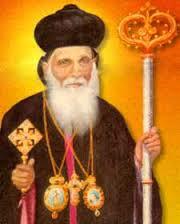 On 2 November 1947 he declared Geevarghese Mar Gregorios and Yeldo Mar Baselios as Saints. From his time onwards the offices of Catholicos and Malankara Metropolitan came to repose in one and the same person. The deep spirituality and wisdom of this Catholicos earned him the title Valiya Bava, or The Great Catholicos. Shedding luster like a Beacon illuminating the history of the church, he led it from glory to glory. He entered the eternal realms on 3 January 1964 at Develokam Aramana. He was laid to rest beside the Devalokam Aramana Chapel. His Anniversary is on 3 January. Athanasios. He served as Manager in Thrikunnath Seminary, Aluva from 1908 to 1910. On February 1913, he was consecrated as Metropolitan Geevarghese Mar Philexinos. He was the Metropolitan of Kottayam and Angamaly diocese. He made Vallikattu Dayara his administrative headquarters. On 30 April 1925 at Niranam, the Holy Synod installed him as the Catholicos of the East. Through prayer and fasting he achieved spiritual strength, which helped him to guide the Malankara Church into green pastures. He passed away on 17 December 1928 at Neyyoor Hospital. He was laid to rest on the northern side of Vallikattu Dayara. His death anniversary is on 17th December. on 2 May 1913 and was laid to rest in Pampakuda Cheriya Palli.